ENTRY LEVEL CLASSES ARE FOR STUDENTS WHO HAVE HAD VERY LITTLE TO NO EXPERIENCE. OUR CLASSES WILL BE A COMBINATION OF BALLET AND JAZZ TECHNIQUE. 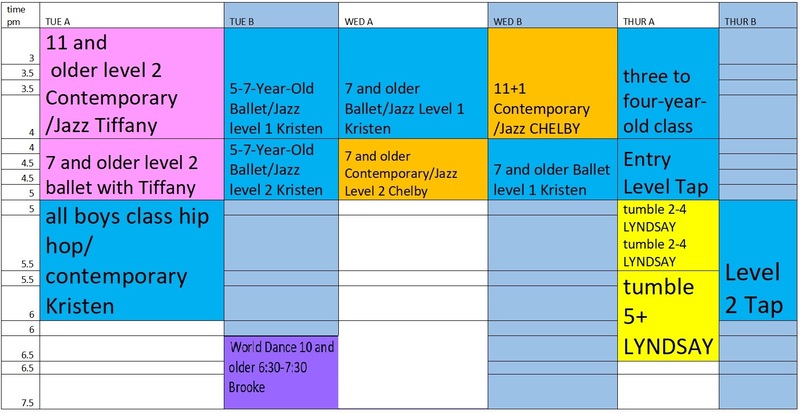 LEVEL 1 CLASSES ARE FOR STUDENTS THAT HAVE HAD A FULL YEAR OR MORE OF DANCE EXPERIENCE AND KNOW THE BASICS ALREADY SUCH AS BALLET POSITIONS, LEAPS AND TURNS. OUR CLASSES WILL BE A COMBINATION OF BALLET AND JAZZ TECHNIQUE. THE SAME PRINCIPLES APPLY TO THE TAP AND HIP HOP CLASSES. STUDENTS HAVE A MONTH TO DECIDE IF THEY WANT TO COMMIT TO THE CLASS, AFTER THAT ATTENDANCE IS REQUIRED THROUGH THE END OF APRIL. WE WILL HAVE 2 DANCE RECITALS, ONE IN DECEMBER BEFORE WINTER BREAK AND ONE AT THE END OF APRIL. OTHER FEES: $70 PERFORMANCE FEE, $20 A CHILD WILL GO TOWARDS THE COST OF RENTING OUT OUR PERFORMANCE SPACE AND PAYING THE TECHNITIONS AND A $50 COSTUME FEE WILL COVER THE CHILDS COSTUME FOR THE PERFORMANCE. FOR THE SPRING PERFROMANCE THERE WILL ALSO BE A $5 ADMISSION FEE INTO THE SHOW BECAUSE THAT PERFORMANCE IS MORE EXPENSIVE TO ORGANIZE, BUT PARENTS WILL BE GIVIN ONE COMP TICKET PER CHILD. THESE EXTRA FEES CAN BE PAID ANY WAY YOU LIKE BY THE END OF OCTOBER AND AGAIN BY THE END OF FEBURARY. PERFORMANCES ARE MANDITORY. STUDENT ATTIRE FOR TAP CAN BE CASUAL. PARENTS NEED TO STAY IN THE FRONT OFFICE OR SOMEWHERE BESIDES THE DANCE FLOOR UNLESS THE CHILD IS 4 YEARS OLD OR YOUNGER. STUDENTS TEND TO PERFROM BETTER WHEN THEY ARE NOT BEING WATCHED, AND TEACHERS DO AS WELL. ALL OF MY TEACHERS ARE SUPER WONDERFUL PEOPLE AND IF YOU EVER HAVE AN ISSUE PLEASE COME TO ME DIRECTLY (KRISTEN COMBS). PLEASE: UNLESS CHILDREN ARE STAYING FOR MORE THAN ONE CLASS, PLEASE DO NOT HAVE THEM BRING A SNACK, IT IS DISTRACTING WHEN THEY ARE ONLY THERE FOR AN HOUR. ALSO, STUDENTS SHOULD BRING THEIR OWN WATERBOTTLE (I HAVE PLENTY OF WATER), AND I WILL ALWAYS ACCEPT CUP DONATIONS IN THE FORM OF DISPOSABLE CUPS.